Do Soundproof Windows Really Work? | Soundproof Windows, Inc. Many of us would prefer to have a quieter home. Whether you live near an airport, busy intersection, freeway, a construction site, a playground or a school, chances are you’re fed up with unwanted noise. You might have heard of soundproof windows or soundproof sliding glass doors, but you aren’t sure if they really work and if they are worth the investment. In this article we discuss the facts about soundproof windows and soundproof sliding glass doors. 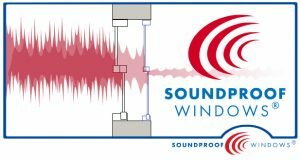 Are Soundproof Windows Really “Soundproof”? Many associate the word “soundproof” with silence. We’re not aware of any commercially available windows that stop 100% of sound, but our windows reduce noise better than any other product on the market. The first thing you need to know about soundproof windows is how they’re graded. Our industry’s unit of measurement for sound is what’s known as an STC rating. STC stands for Sound Transmission Class and it is an instrument measurement of how much noise is stopped by objects such as windows, doors, walls and building materials. STC ratings generally range from 18 to 38 for windows. The STC rating is the average amount of noise stopped at 18 different frequencies, measured in decibels. 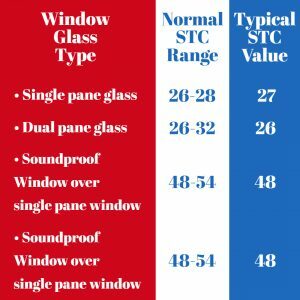 For single pane windows, the STC Rating is most likely between 26 and 28. The STC Rating for our soundproof windows is 48-54 on average. In other words, our windows can stop more than twice the noise as single pane windows. What Are the Mechanisms that Reduce Sound Transmission in Soundproof Windows? Your instincts on how soundproof windows work are probably right. Soundproofing and STC ratings are largely contingent upon four factors. The thickness of the windows; the thicker the windows, the more noise stopping power they have. The amount of space between the window panes. The greater the space, the more noise gets stopped. Additional materials applied to the glass itself, such as plastic. Glass that is covered in plastic on each side is known as a “laminated window”. The amount of pressure between the window and the frame. The greater the pressure, the less that noise can penetrate a home. We at Soundproof Windows designed the best soundproof windows on the market using factors 2-4 above. The laminated glass we use has an inner layer of PVB plastic that stops vibrations like a finger on a tuning fork. Secondly, there is an air space between the two windows (the existing window and the new Soundproof window), so the frame is isolated from vibrations. Finally, we spring-load the seals in our frame, which puts a constant squeeze on the glass panels. This constant squeeze prevents sound leaks and helps stop the noise from vibrating through the glass. A wine glass will ring when struck, but if you hold it firmly there is no ring. This is similar to how our frame squeezes our glass panels to keep them quiet and reduce noise. Do Soundproof Sliding Glass Doors Work the Same Way? Soundproof Windows offers custom soundproof sliding glass doors that are just as effective as soundproof windows. Like our soundproof windows model, we add a second sliding glass door that does even more to meet your soundproofing needs and security. Soundproof sliding glass doors can be mounted as an addition to the inside or outside of your pre-existing sliding glass doors. Using a soundproof sliding glass door will reduce sound by 75% as well as insulate and provide a substantial amount more safety to your residence. Soundproof sliding glass doors use laminated glass that is substantially stronger than the typical, tempered glass that is used with the average sliding glass door. Laminated glass is very difficult to break through and the noise alone to break laminated glass is deafening, which can stave off potential intruders. Soundproof Windows offers sliding glass doors in white, aluminum and brown, but other custom colors are available as well. Our goal at Soundproof Windows is to provide an incredible service and product that will conveniently meet the needs of your home or HOA. Give us a call at 877-438-7843 or use this form to obtain your free estimate!